Yesterday was our anniversary. My husband had gotten home late the night before, but he still showed up at breakfast with a box of candy and a card for me. I always try to bake him a cherry pie, his favorite dessert, on his birthday, Valentines Day, and our anniversary, but I have been so busy I hadn’t been to the store and didn’t have any cherries. The torte in the picture above is Jennifer’s Apple Torte, but mine looked just the same. I cooked down the juice from draining the peaches, added some xylitol, liquid sugar substitute, and cinnamon, and served the torte warm with a drizzle of peach syrup and heavy cream. Pure heaven! Jennifer’s Gluten-Free Bake Mix is the only flour substitute that I know about that is both low-carb AND gluten-free. It makes baked goods that taste exactly like they were made with regular wheat flour. 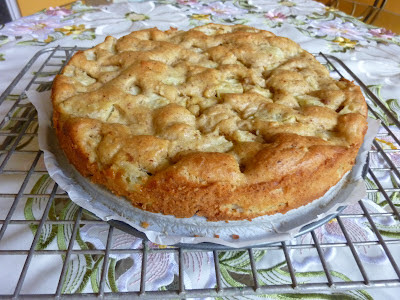 (The recipe for the Bake Mix is here: http://low-carb-news.blogspot.com/2012/05/splendid-gluten-free-bake-mix-always-on.html.) She has lots more recipes that use it on her blog at http://low-carb-news.blogspot.com/. I’m going to try making this torte with cherries next time and then with rhubarb. Thanks, Jennifer, I love this recipe! This is simply a delightful, delicious dessert that is sure to please. Preheat oven to 350 degrees F. Line an 8-inch springform pan with parchment paper. In medium bowl, combine Gluten-Free Bake Mix, baking powder, and salt. Place prepared apples in casserole dish, sprinkle water over apples, replace lid and microwave on high 2 minutes. Apples will be almost tender. Pour into a colander placed over a bowl and drain apples. Pat apples lightly with paper towels to remove excess moisture. In food processor, process eggs. Add EZ-Sweetz, erythritol, rum and vanilla extract; process. Add half dry ingredients and half melted butter; process. Repeat. Fold in apples, so that fruit is coated. Scrape into prepared pan. Bake 30 minutes, or until golden brown. If desired, serve with whipped cream sweetened with EZ-Sweetz or serve warm with low-carb vanilla ice cream. This torte is also wonderful served cold or at room temperature. Apple torte, Peach torte. Bookmark. Ooh, I have a silly big grin on my face right about now. lol Thank you, Judy. You're such a good friend and it's such an honor to work you on the next cookbook and on the Ez-Sweetz booklet which is in your capable hands. You are so talented in a gazillion ways – not just with recipes, but being an artist and producing cookbooks that look like a work of art as well as being technically fantastic! The booklet will feature 25 recipes from 5 of the best low-carb food writers in the world (Well, four of the best and me.) George Stella, Dana Carpender, Jennifer Eloff, Laura Dolson, and yours truely. I've only had a couple of weeks to put it together, but it looks really good at this point. It will be part of the launch of this new zero-carb, zero-calorie liquid sweetener in stores nationwide and in Europe in a few weeks. Stay tuned for more info. Hi Jennifer. Thanks for all the kind words. Not sure I can live up to your opinion, especially the part about being technically fantastic! I fight with my computer every day and don't always win and I can't even figure out how to use my cell phone–as a PHONE! But I keep trying. In that case, Thank You very much, Jennifer! I think the small amount of gluten-free oat flour would disqualify it as strictly Paleo. Oats are grains, but perhaps the most innocent of them all. Low carb, sugar-free, and gluten-free are good enough for me.